Basking in the glory of a Nedbank Cup triumph, Free State Stars coach Luc Eymael still couldn’t resist a little dig at Kaizer Chiefs’ departed leader Steve Komphela. “Second year in South Africa, one trophy, I know some of the guys who worked 13 years without winning a trophy,” said Eymael, in a thinly-veiled reference to Komphela, with whom he has had an ongoing spat for some time. The Belgian continues to deny links to the Kaizer Chiefs job, saying that if, on his return to his homeland on Friday, he is still at Free State Stars, that is where he will remain next season. Ironically, however, success against Maritzburg United in Saturday’s final must have enhanced Eymael’s credentials for the Amakhosi job. It wasn’t pretty, but it was pretty effective, was a phrase that sprung to mind after watching Stars hang on to a lead given them by Goodman Dlamini, with a display of extreme tactical organisation when not in possession of the ball. It was United who had most of the spherical object, but they battled to find a way through the Stars defence, with Paulus Masehe superb in front of his back four, and Rooi Mahamutsa and company a picture of focus and determination behind him too. 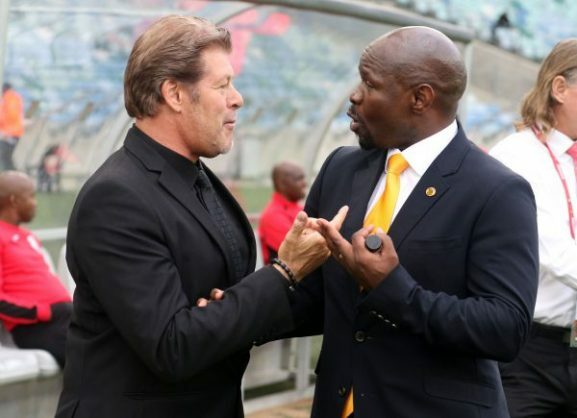 For Eymael, it was some achievement with a side of limited resources, who embarrassed Chiefs, of course, in the semifinals, ultimately speeding up Komphela’s departure. Chiefs fans wanting attractive football would be best warned off Eymael, but following three seasons without a trophy at Naturena, perhaps refilling the trophy cabinet is a priority for Kaizer Motaung. In this case, the Chiefs chairman could do worse than Eymael, who has also won trophies in spells in the DR Congo, Gabon and Kenya. One clear problem for Chiefs regarding Eymael, however, could be a prickly temperament, a man who appears prepared to go off on a tangent about a perceived injustice at any moment. Take Saturday, where he had a go at a journalist for referring to him as a “villain”, at the start of his press conference, having just won the Nedbank Cup. The words “completely pointless” did spring to mind, and one wonders just how Eymael would respond to the inevitable pressures of coaching a side the size of Chiefs, though AS Vita, of course, are a behemoth of a side in their own right, and he did very well in Kinshasa. For Maritzburg United, meanwhile, this was another lesson that should still give them encouragement under their youthful and talented coach Fadlu Davids. United have played football to thrill this season, and it was great to see that amount of Team of Choice supporters at Cape Town Stadium on Saturday. The signs are that Davids will stay with United, and one hopes he is given time to build this United team further, as well as support in the transfer market. This includes, of course, keeping stars like Siphesihle Ndlovu and Lebo Maboe, who will no doubt attract the interest of teams like Mamelodi Sundowns in the transfer window. Davids has said they will stay in Maritzburg, but it remains to be seen what happens in reality if and when the big guns turn up with their chequebooks.